A couple weeks ago, Lauren and I got to talking about how we’d both let our mixer posts fade … whoops! It was decided marshmallows should be on the list. Maybe that weekend, maybe the next, definitely soon. 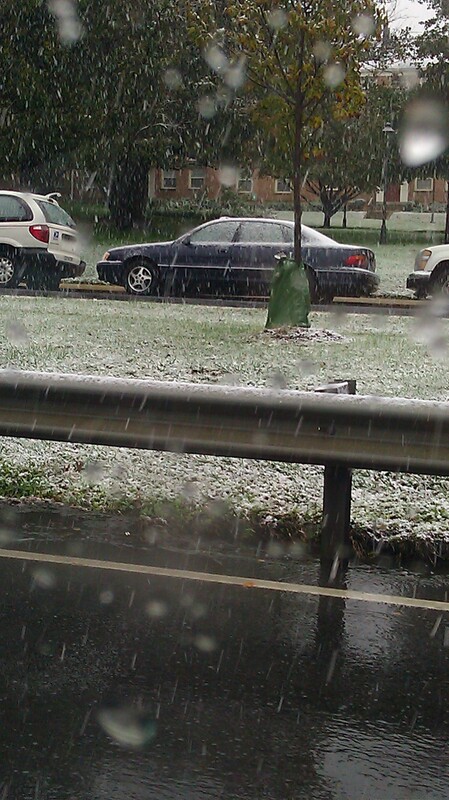 Clearly, snow calls for hot chocolate. 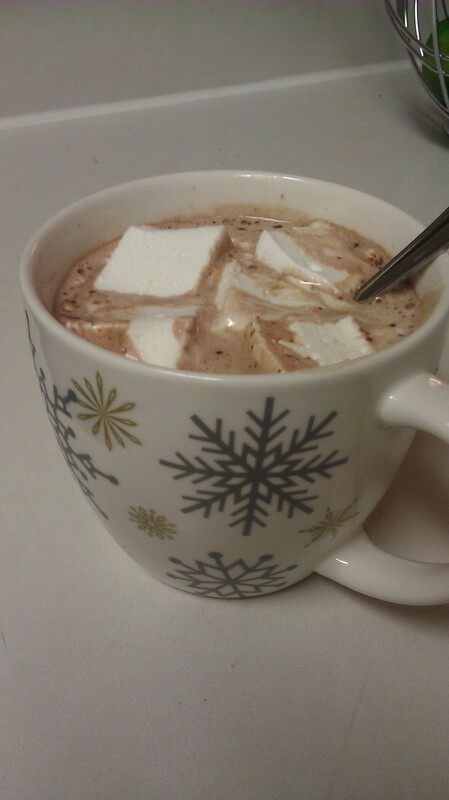 And just as clearly, hot chocolate needs marshmallows. The lovely Jen had linked us back to the Smitten Kitchen recipe, so armed with that I headed to the store … to buy gelatin. Only. The thing I’m loving most about baking/cooking more is having staples on hand so I literally can wake up, think I want to make something, and not have to do a grocery run before starting. Armed with a box of unflavored gelatin, I was off. Step 1: Decide to make mallows 2 nights before husband’s big race. Make sure you wait until he’s trying to sleep, he’ll complain loudly enough to keep you entertained. Step 2: Freak out about just how much sugar (in many forms) were going into it. That mixture above? 2 cups sugar + 1/2 cup corn syrup. Ewwwwww. Promise yourself you will NOT to tell husband how much sugar, so he’ll eat them. 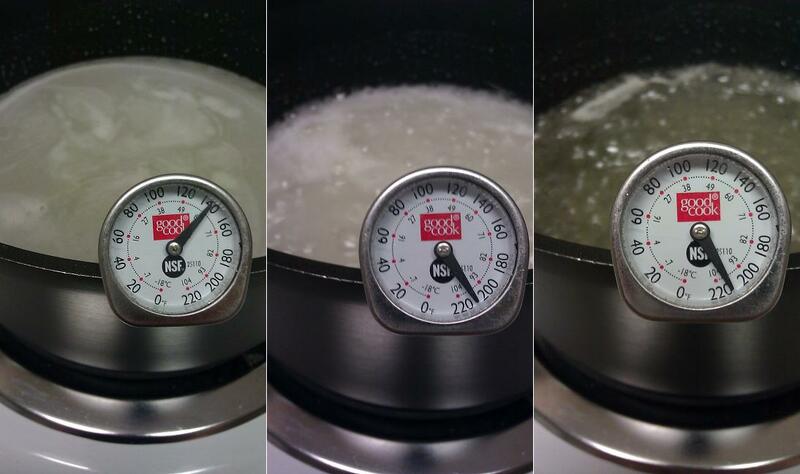 Step 3: Realize your candy thermometer only goes to 220, when the recipe calls for 240. Decide to wing it. Step 4: Hover awkwardly over your stove, trying to get photos of the process. Fail miserably at lining up the thermometer in multiple shots. Also fail at getting the light balance to stay constant for longer than one shot. Step 5: Realize your thermometer has crapped out at about 215. Decide to go on look (it needs to be clear!) and hope for the best. Step 6: Back away at lightening speed when you turn on Alice. 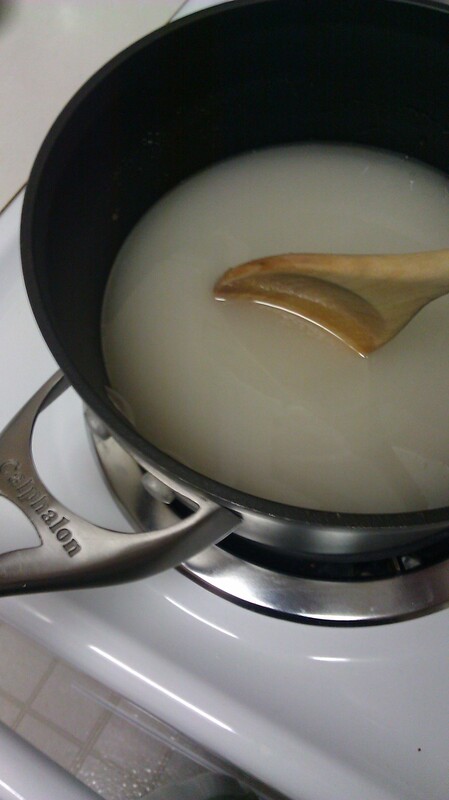 Pro tip: boiling sugar and unflavored gelatin smell like burning. Terrible terrible burning. Step 7: Worry that you effed it up while Alice does all the work for you. Add extra vanilla to try and mask the burning you’re sure will come through in the taste. Step 8: Do another round of awkward hovering for photos. This time, do it will one handedly pouring the mallow fluff into your pan. Again totally fail at lining up and light/color balancing. Don’t forget to make sure your booze is clearly visible in at least one photo. Step 9: Ignore Deb’s advise, and try to scrape down the bowl. Be successful! Decide your success was a fluke and to never do it again. Step 9: Misread the directions and top the fluff with ONE CUP of confectioner’s sugar instead of the prescribed 1/4 cup. Realize your mistake too late and decide to roll with it. Step 10: Put in fridge to set. Pout when you realize you won’t be able to eat them until tomorrow. Flounce out of the kitchen in your angst and totally forget to soak the wisk. This will haunt you when cleaning up, tomorrow. 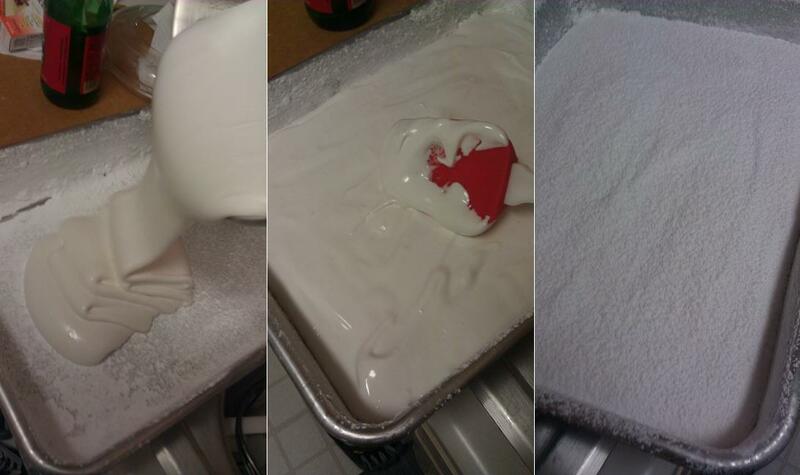 Step 11: Forget to oil your pizza cutter when cutting the mallows the next day. 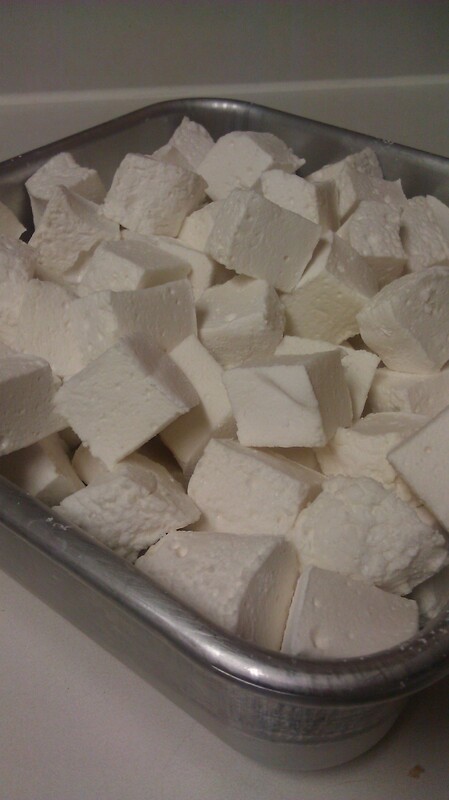 End up with slightly curved, different size mallows. Step 12: Beat down the worry and try one. Realize that while you cannot taste the burning smell, you also used WAY too much vanilla. Decide they are still delicious. Step 13: Give one to husband. Have him reply “that tastes like a real marshmallow” excitedly. Bang head against table at the realization he still doesn’t consider homemade goodies to be “real”. Step 14: Bust out your favorite winter mug and make some hot chocolate. 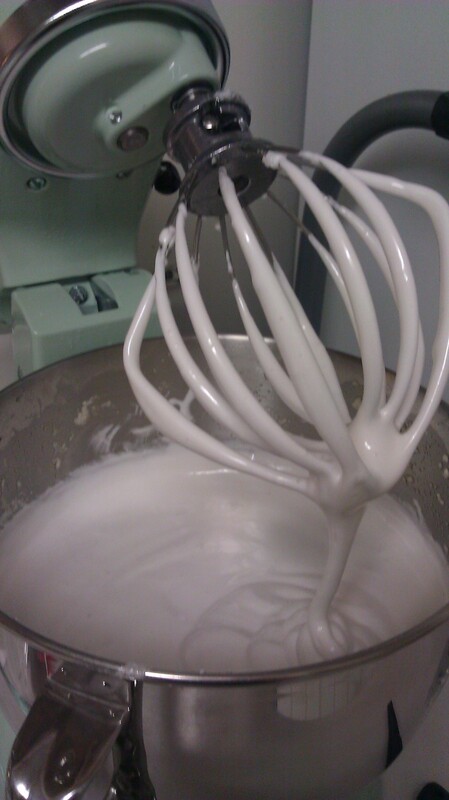 Add too many mallows. Decide all the steps were totally worth it. Woow, they look delicious. I am always scared of recipes that involve a sugar thermometer. I do not own one yet, but I want to try. I am so jealous of you guys and your kitchen aids… one day ! As for the candy thermometer … I was a little worried, too. I bought it for bread making (since it has to be a particular temp to get the yeast to work properly), but this was the first time I actually used it for “candy”. I was nervous about it, but this one just hooks on the side of my pan, and I don’t have to touch it … just watch for it to hit the right temp. Uh, YUM! They look delicious. Nice work, lady! I am glad I don’t like marshmallows because the thought of trying to make them terrifies me. Bravo. Those look AMAZING. The process of getting there sounds a little stressful though–thanks for sharing. I have a candy thermometer that I’ve only used once so far to make toffee, which involved a big debate with my mom, who was visiting at the time, about whether to believe the thermometer or the way it looks. Note to self: when trying a new recipe that involves boiling sugar and makes you nervous already, don’t do it when your mom is staring over your shoulder. My kitchen managed to stay in one piece, not be covered in flour, and I didn’t have to throw anything out. And other than the setting overnight, the entire process took about 25 minutes. Easy. I may need to make them again because your hot cocoa looks so good that I think I need to repeat it. Using a candy thermometer scares me. I tried to make peanut brittle a couple of years ago and it nearly ended in disaster. I’ve decided that boiling sugar to temperatures in the 300’s is above my pay grade. holy BANANAS those marshmallows look INCREDIBLE.